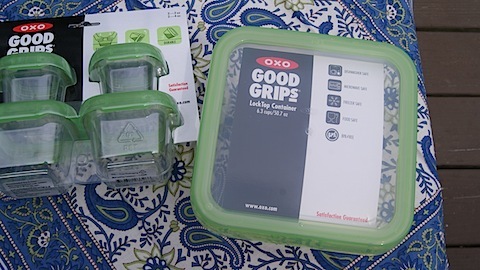 OXO Good Grips Storage Container Giveaway! After meeting a representative from OXO at the Foodbuzz Conference in November (and winning their trivia contest) I was excited to become of their blogger outreach program. 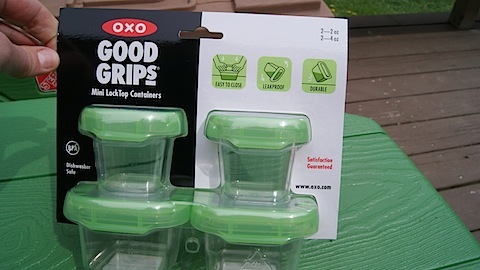 I was excited when a large package arrived on my doorstep with two sets of Good Grips LockTop Containers. The containers are light weight but feel very sturdy. They are made of a BPA Free plastic and offer a tight seal. Their mini set would be perfect for taking dressings, yogurt or a scoop of protein powder out for the day. 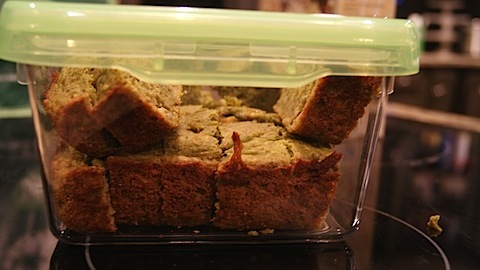 The large container has made an ideal storage place from fresh spinach banana bread and leftover quinoa salad. I am so excited to share a set with you! Please let me know what you need new storage containers for. Are you packing a salad for work or do you need a new container for your leftovers? These look like they’d be great for my 3-year-old’s lunch and snacks! We’re constantly losing our to go containers … Either taking leftovers to work, or taking food to our grandparents. I’ve managed to keep track of all my pampered chef bowls thus far though! I definitely need new containers to pack lunches in – just started substitute teaching! I pack my lunch for work every day, so these containers would definitely not go to waste! I’ve been bad recently about going out to ear for lunch–so I’m trying to be better (and healthier) with my lunch options–do good containers are a must to make sure there are so oopsies with food falling out or spilling. Taking lunch to work! I always run out by the end of the week. I use the small ones for the kids snacks. I hate how plastic bags crush food and are bad for the environment. I would use them for broths! I’m a teacher and pack my lunch everyday. I also pack my son and daughter’s lunch for the day as well. I could use more containers! I would use the storage for leftovers. I keep running out of containers! I’m looking for more modern containers. Mine still work well but have a vintage look to them! I would love to have these for our leftovers! I grow my own veggies and these would be great for storing them in pre set servings!! I need new storage containers for leftovers and lunches 🙂 *Thanks* for the giveaway! I would store quinoa salad in the large container and dressings or parfaits in the smaller containers. Either way, I think these would look excellent in my kitchen ;).